A while back we posted a clip from a local television station which featured our own Kevin Berthelette and a basic run down on the new General I-Carver Junior CNC Machine. Unfortunately, sawdust and sensitive electronic and video equipment don’t mix, so we were unable to show an actual demo of how this awesome and surprisingly affordable CNC works, on the show. Well the folks at General International have helped us out by producing the following video whi ch shows the features and operation of the I-Carver Junior. A Three Axis machine, the I-Carver Junior covers a travel area of 13″ X 18″ X 3″ deep and can be used on wood, acrylic and plastics. The fast and dependable brushless motor and precision platen system churns out beautiful detailed and intricate carvings at a rate of 125 inches per minute. 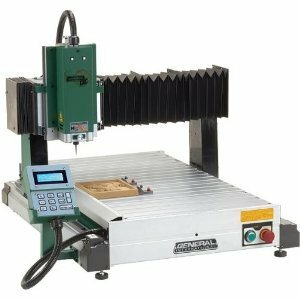 The smaller version of the popular 40-915 M1 also available from General, this unit offers the same rugged construction and ease of use with an affordable price tag allowing any small shop or school to introduce CNC into their woodshop. The concept is simple. I-Picture software will allow you to import bitmap files (JPG, GIF, TIF, PNG, BMP) and convert the various levels of grayscale into cutting depth. Is is really that simple! Perfect for elementary schools, as the students can design projects simple and easily without the need for complex CAD design software. Small shops, designers and hobbyists looking to add decorative touches to projects will also find it a great value to their business. So check out this video then drop into your local KMS store and check it out in 3D! This entry was posted in Archives, New Tools, Shop Equipment, Woodworking by Gord Field. Bookmark the permalink. ← Previous Previous post: Sharpening Your Own Bandsaw Blades.